SOMETIMES in bleak and sad stories you have to really search hard for the little ray of hope. It’s a pointless exercise for some but even a small difference can make all the difference in the world. The mass flooding in northern England wrecked Christmas for thousands of families. Homes ruined, possessions wrecked, lives irrevocably changed. People often regard climate change as a looming environmental catastrophe but it is the great crisis of our time right now. It’s the invisible terrorist that can strike whenever. Its effects have been sharply felt in other parts of the world, but make no mistake about it, it was here too. Floods have occurred recently before, and every time they happen, remember that this government slashed spending on flood defences and has failed to invest in renewable energies. It has failed to implement environmental policies that tackle the crisis of climate change and will leave future generations in serious peril. We are already exposed to it. But after the dark comes the dawn. And there was light. Little dots of it but lots of them. The communal strength of those affected, co-operating together, was an inspiring show of defiance and solidarity. Neighbours banded together, helping each other out. Anguish was postponed while they dealt with the crisis at hand. Charities inevitably have intervened. But perhaps what hasn’t been seriously acknowledged is the quiet contribution of the British Muslim community. Volunteers from various Muslim mosques and charities became involved, offering food, aid and warm clothes. They have helped vastly in the clear-up process and the rebuilding that comes with it. Syrian refugees were seen helping protect homes in Rochdale, an act of gratitude for the generosity bestowed upon them. Losing homes is a pain they are all too familiar with. When you consider the besieged mentality among the British Muslim community, this is a truly wonderful piece of action. No amount of terrorism-condemning, not-in-my-name apologies can match acts of social justice. In the wake of “counter-terrorism” legislations that have followed September 11 2001 and spine-chilling media hostility, British Muslims have become wary and defensive. For British Muslims, the identity crisis has often lain in trying to distinguish what is the difference in being a Muslim and being a British Muslim. Are some values forgotten or interpreted in a different light? For non-Muslim Britons, perhaps there’s an element of that fear and wonder too. But these stories of charity are incredibly important in empowering a minority stripped of the social confidence to feel British and proudly so while maintaining some cultural differences. It could also pave a way for the government to promote integration within the Muslim community without demanding conformity by criminalising a faith group for values rather than challenging them. It opens space for abandoning the failed Prevent strategy that lacks grassroots support and instead working with schools and mosques to help raise a collective identity among the British Muslim youth that is intrinsically tied to the notion of social justice. Many young Muslims in Britain feel angry and disconnected from the political system, refusing to participate in it. But social engagement gives them a way to connect with the problems of our flawed system while not feeling as if they have been sucked into it. It builds community bonds again and helps defeat the question of “integration.” Can anyone maintain that British Muslims are not patriotic or that they are dangerous when as a religious group, surveys have found them to be the most charitable? When Syrian refugees help out in Rochdale or mosques send aid, can people say with a straight face that Muslims are dangerous? Yes, there are issues of extremism, patriarchy and homophobia that need to be tackled. These are issues with solutions rooted within the Muslim community — but for now there has to be a way to engage the Muslim youth within the country. These floods have shown that British Muslims hold the values of community, charity, family and social justice very strongly. UK flooding: Syrian refugees help build flood defences near Manchester ‘to give something back’. 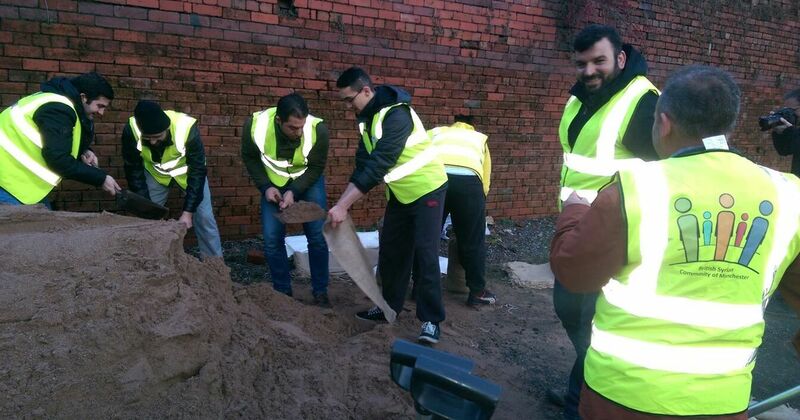 A group of Syrian men have been filling sandbags in Littleborough, near Rochdale: here. And here. Kind-hearted Syrian refugees build flood defences in their new Northern hometown ‘to give something back’: here. AFTER more heavy rain pummelled Britain yesterday, trade unionists in northern England are mobilising to collect essential items for victims of the floods. More than 6,000 homes and hundreds of businesses have been flooded in northern England and general union GMB plans to open its offices today as collection points for essential goods following an appeal to members: here. Revealed: how Tory cuts are wrecking UK flood defences. Document seen by ministers before recent storms warns that number of at-risk households will double: here. UK: Hebden Bridge and Mytholmroyd residents describe flood destruction: here. This entry was posted in Disasters, Human rights and tagged refugees, UK by petrel41. Bookmark the permalink. Great inspirational piece, thank you. I probably will find more inspirational stuff about refugees to blog about yet. I look forward to reading your post, and rebloggin. The refugees need all the help we can provide in letting the world know of their stories.